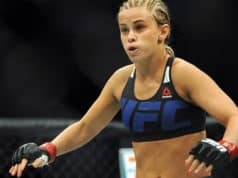 Surging UFC women’s strawweight contender Paige VanZant recently got a rarely-seen tougher fight when Rose Namajunas replaced her original opponent Joanne Calderwood in the main event of December 10’s UFC Fight Night 80 from Las Vegas. “This is a great fight for me. I plan to win it in every area. I definitely haven’t shown off all of my skillset that I have, so I’m excited to get back in there. I’ve made a lot of improvements since my last fight. I’ve been able to watch my fights and see the areas I’ve improved and the areas that still need work. So I’m definitely going to be ready for this, wherever the fight goes.